Fleeing the evil Publishing Companies, the indie and mid-listers have formed a base on the interwebz. Their new base is threatened though, as the Publishers have discovered their location and have sought to invade it themselves. Through their alliance with Amazon, Smashwords and other e-book publication platforms, the indie and mid-listers confront the Publishers and learn a dark secret – they still want to be published in paper. I’ve been following a few conversations about e-books and the new industry for awhile. There are some interesting perspectives out there, ranging from some of the large publishing houses “We want the industry to stay exactly the same” to the kid in his room “I’ve just published 25,000 words of unedited crap – I is famus”. Both extremes are rather annoying, one might as well be sitting in a corner with their fingers in their ears shouting “La la la, I am not listening” whilst the other group really should have gone to the Dagobah system and learnt from Yoda the ways of the dictionary. A fellow West Aussie has had an intriguing set of Aussie authors and publishers guest post on his blog recently. The result has been The Grand Conversation. Having not, as yet, published anything I can quite comfortably say that this entire conversation gives great perspective to anyone about to or wishing to enter the industry. As a long time reader though, I am qualified to cast as many aspersions on the industry as the next blogger. I am fickle, read my post! Are the publishers really to blame for the current woes of the industry? Woes? I’d almost say that with e-books out there now it is an exciting time. Not so exciting if you planned on making a visit to Borders or Angus and Robertson stores any time soon, but with winners there must be losers. I’d actually say that book stores and publishers combined to make e-books and online shopping so attractive. I’m sure I’m not alone in having traveled to a book store hoping to get the latest from Author X only to find it isn’t in stock, which is amazing considering how prolific Author X is. Or possibly you have experienced wanting to stock up on your favourite author only to find the shelves bereft of those titles. Lets also face the fact that you are more likely to find a celebrity biography than you are to find much in the way of scifi, or similar genres (unless you are talking specialist independent stores). In fact quite often the bookstores with the best ranges tend to be second-hand bookstores. The range in e-books, despite only having a few 100,000 titles available, is vast and getting bigger daily. The e-book range also includes a lot of authors that we haven’t heard of, or had limited distribution under the previous publishing model. It isn’t just the range of books available online or in e-book format, it is the pricing. Sure we have the Aussie online Dymocks, A&R and Borders charging trade paperback prices for an e-pub file, but the smarter companies are pricing their books under $10 and the independents are pricing under $5 – often as low as $0.99. Quite simply you can have a book in your hot little e-reader a minute after you readjusted your backside on the couch for much less than comparative entertainment. This is a big win for authors and readers alike. You no longer have to run the gauntlet of James Paterson, celebrity chef, cricket captain tour diaries and store clerks who can’t read. Wait, haven’t I just absolved the evil publishers of blame for the dearth of decent documents? Well no. At some stage publishers decided to set up a business model that meant they lost money on a lot of titles to make money off of a few titles. I too would like to give the cast of Jersey Shore millions of dollars in advances for an “autobiography” ghost written by a clearly suicidal struggling author, to then release a book aimed at a target market not known for their ability to read. Makes sense to me. Most of what publishers produce is hit and prefix. With these grand mistakes they have essentially set themselves up to require 12 James Paterson books in a year and can’t take the chance on anyone new. 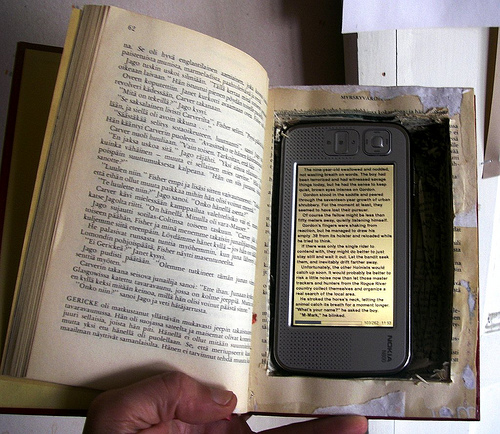 Will E-books manage to rescue the novel from the publishers? Find out in Return of the Reader. 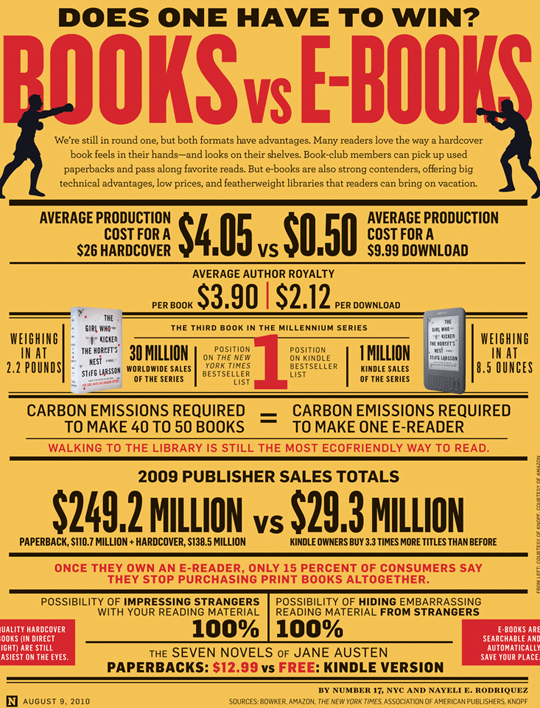 Book vs E-book: lets call it a draw.